There are times when magicians just want to lose their spectator's selection in the middle of the deck and get it over with, without any preparation, control or misdirection. 'ACID' is just that, filling up holes that have been left open at the most commonly used card controls and switches. 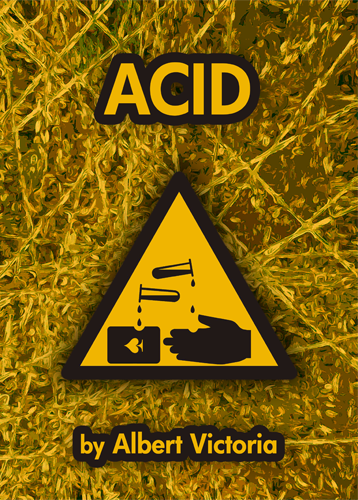 Not only does 'ACID' allow you to make selections magically come back to the top of the deck for an infinite amount of times, but the spectators are able to burn your hands as well. This is an independent take on the same idea behind Derren Brown's 'Velvet Turnover'. Totally buying this! Thanks Albert and Mark! Best cover art ever! Or am I not allowed to say that myself. Mark is amazing when it comes to name making and cover arts! Awww, thanks! Although... this is the name you gave it yourself! I just made it more solid I guess. Yay! this is awesome. Can't wait to get my CC, first thing I will buy! I love the cover art Mark. Did you do it? But then I really like all the cover designs. I'm watching it now and this is complete and utter, unadulterated, pure as the sacred behind of St. Finius himself.... gold-dust. This move is awesome. The mechanics are easier than I had expected, and Albert explains them incredibly well. I picked up the basics within minutes but I think the part that will take the most effort is concentrating on angles. That said however the move is pretty good on angles, as long as one stays sharp and aware, something my training with the SAS will have prepared me well for, though I suspect mere mortals will also find this just requires a good practise. Lets face it; Albert knows his stuff, and this shows in his thorough teaching. Everything you need to know is explained in detail and I was left feeling very confident that all I need to do now is practise. You also get a ton of applications for the move, from the whole Acid Sandwich routine to quick bits like other switching applications, a colour change, stealing etc. And in addition to this you also have the luxury of being able to go back and rewatch not only the tutorial but also the "recap" sections where we see a performers view of the moves being carried out multiple times. This I find to be incredibly useful so that as I practise I can put these recaps on loop and ensure that I am picking up all the small details. Like all the releases I've bought from Darksleights this is very high quality stuff. As tutorials go they are always thorough, well produced, and rediculously well priced. The move is a real worker and one that I think may well shoot up to my top 10 most useful and used moves. It is powerful, relatively easy to learn, can be used for many applications and looks great as it's happening Albert, thank you for this wonderful addition to the magic community. I hope you are very, very proud. Ummmmm can I get this for free? Of course not! Who do you think you are?! Oh, never mind, I spotted the sarcasm in your emoticon. Wrong! It's freeloader without an 's' cause I'm awesome! Only I get free stuff! Actually, I agree. Cover art looks AWESOME!!! It's just a twist on the official acid/corrosive warning sign.